As always, I am open to comments and suggestions for improvement. 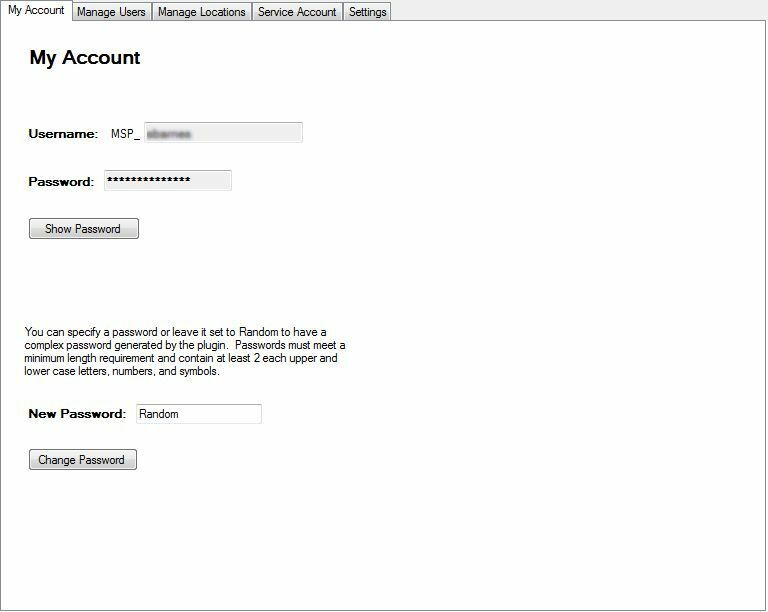 The "My Account" screen is the only tab visible to Labtech users without the "Security Class Config" right. Are the passwords stored encrypted? or plain text in the SQL database? Encrypted using MySQL's AES_ENCRYPT command. 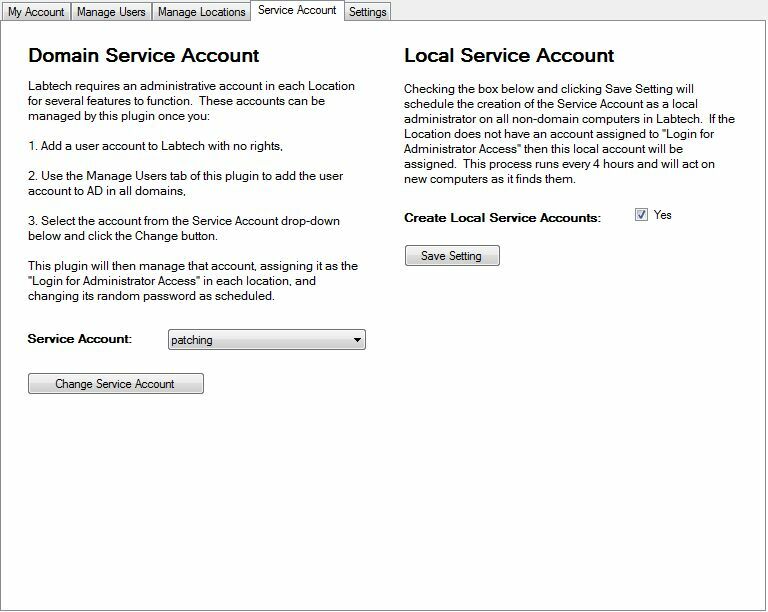 The plug-in appears to load as I have an menu item named MSP Accounts to the right of Help, but when I click on it, nothing happens. odd. try restarting the "Labtech Database Agent" service on the Labtech server. Tried disabling and enabling again as well as restarting the database agent from the server rather than the control center with the same results. This is what I found in the LabTech Errors log. thanks, that log made it easy to find. it has been fixed. Download it again and Update the plugin. That fixed that issue, but it is throwing lots of dsadd failures when trying to add a single account as a test. From the output it looks like it failed to create the OU, tried again, and then tried to add the user all of which failed. I do not see any output where it created the user and confirmed that the user does not exist. Disabling for now. Parameters: cmd!! !/C dsadd ou "Managed_Service_Provider User Accounts"
Output: dsadd failed:Value for 'Target object for this command' has incorrect format. I'm sorry. Obviously needed some beta testers to send to before releasing here. I'll get this fixed today. fixing the bug was simple enough. but i'm doing more testing from a new user perspective. * trying to implement a way to verify changes after they are made and then either report or try to fix. -Not push to every client when adding a user to MSP Users tab. Maybe leave that to Manage Locations but add all clients. -Removing "User Accounts" addition from the end of my MSP Name. Nice work!! We have been wanting to use individual user accounts for all of our clients but would be a lot of work managing those user accounts. This is going to make that super simple. -Not push to every client when adding a user to MSP Users tab. kind of defeats the purpose of the plugin. what is the reasoning here? what would be better way to exclude locations; another tab with a list and checkboxes? hmm. i should make stuff like that configurable just not sure how that would impact existing implementations. i going to have to think about this one. From the Manage Users tab as soon as I add a user it adds it to all of my clients. I think it would be better if you could set up your users then push them whenever your ready. 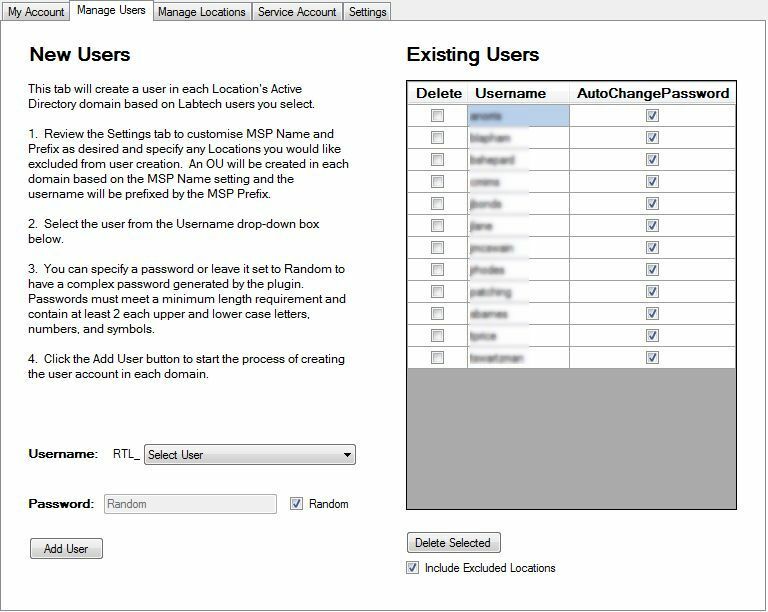 More for peace of mind that I can set up my users then configure my exclusions then push to all clients that are not part of my exclusions. That sounds good or show the list of clients and domains with check boxes. 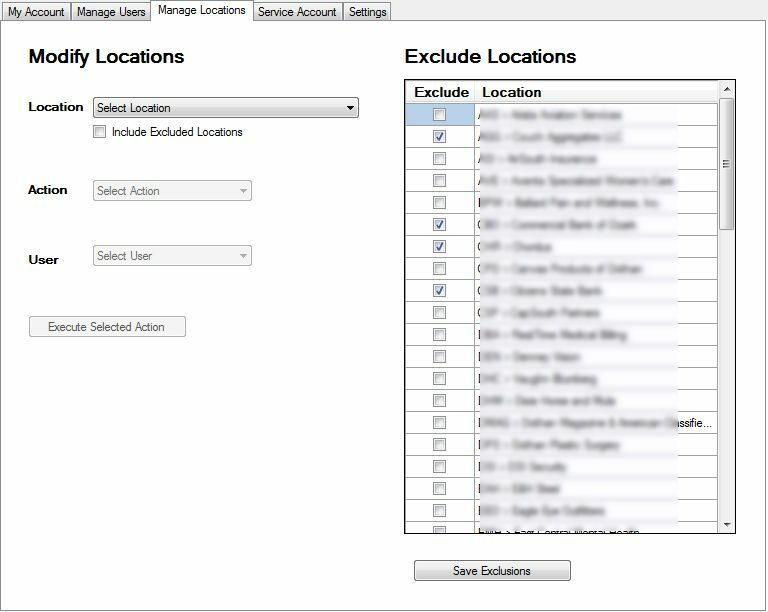 There is a limit to how many locations you can add to your exclude locations box in your settings tab. It also can be a pain to gather all of your location ID's. Maybe by default it adds this but you can choose to opt out. Otherwise as long as the OU gets added automatically I suppose it doesn't matter. I just have OU's that are already there with the name I was trying to use. Added validation and alternate fallback methods for create and delete. Added separate validation steps to verify the account changes. User will receive an email from the validation about 20 minutes after the command has been issued. As far as reliability goes this version makes the previous one look silly. then configure my exclusions then push to all clients that are not part of my exclusions. This was written from our perspective of there being 2 sets of clients; the first allowing all techs, and the second requiring prior approval of user adds. From the sound of your request it seems like you have user specific exclusions or at least many more sets of exclusions? I'm going to have to think about the UI and manageability of that many variations. This is great. Could potentially replace the many scripts I have to do this manually. Can I make a couple of feature requests? Also, I'd request the ability to also add these changes to Mac clients. I haven't tested, but I assume this is only built for Windows at the moment. how would you want to choose which computers to add users to? Hey this looks like it would be a good replacement for the 5 scripts we run constantly! we make a domain admin account *and* a local account with the same creds across all machines domain and non-domain joined. This way during an issue , like network issue, DNS , or malware hijack we have a local account that can get on the machine in safe mode or anytime the domain is not available. We did ours similar where we made a group of non-changing networks/locations and those are skipped . We made a checkbox at the client level for our scripts to check. While it works I know it can be done much easier and this looks like the right way to do it. Have this installed and am currently testing in Lab environment with 10.5. Looks pretty good so far. Conceptually this is great. Simplifies and solves for manually scripted processes I do today. So how are the passwords retrieved for your tech accounts so they can logon and utilize these accounts after they have been created? I must be missing something stupid simple here. This plugin is not properly registering with LT Plugin Manager and is not showing in the LT DB Table for plugins with a proper GUID. Was this developed following the SDK guidelines? Just curious as to how we know the version we are running and how you plan on updates for future releases? the first tab of the plugin "My Account" allow the user to view and change their own password. we make a domain admin account *and* a local account with the same creds across all machines domain and non-domain joined. i'm liking the idea of a single account per location pushed to each machine as a local account. and i can store/randomize the password like i do for the service account. simple to implement and the UI would just be 1 checkbox "add local account to each workstation"
should it be added to just workstations or servers also?